We saw an example of an exponential growth graph (showing how invested money grows over time) at the beginning of the chapter. The exponential curve is especially important in mathematics. Exponential growth and decay are common events in science and engineering and it is valuable if you know and recognise the shape of these curves. Sketch the graph of `y = 10^x`. Note that the curve passes through `(0, 1)` (on the y-axis). For negative `x`-values, the graph gets very close to the `x`-axis, but doesn't touch it. This is an exponential growth curve, where the y-value increases and the slope of the curve increases as x increases. 100 g of this radioactive material decays to half of its volume in 6.5 minutes, and to about 12 g after 20 minutes. Radioactive decay is the most common example of exponential decay. Here we have 100 g of radioactive material decaying over time. Notice that the function value (the y-values) get smaller and smaller as x gets larger (but the curve never cuts through the x-axis.). Also notice that the slope of the curve is always negative, but gets closer to 0 as x increases. Since the amount of radioactive material becomes less over time, and the amount we are talking about becomes meaningless, we normally talk about the half life, that is, the amount of time it takes for the substance to reduce to half of its original mass. In our example, it takes about 6.5 minutes for the 100 g of stuff to decay to 50 g.
Sketch the graph of `y = log_10 x`. Notice that we cannot take zero or negative values for x. Can you figure out why not? Our curve passes through `(1, 0)` (on the x-axis). If we plot them on the same axes, we see that they are just reflections of each other in the line y = x. In this graph, `f(x) = 10^x` is in green and `f(x) = log\ x` is in magenta, and we can see they are reflections of each other in y = x (dashed, grey). Graphs of `y=10^x` (green) and `y=log_10 x` (magenta). v = 95(1 − e-0.1t) where v is in km/h and t is the time of fall in seconds. Graph of v = 95(1 − e-0.1t). If we take larger values of t, the velocity does not go over `95`. In this case, the terminal velocity of the object is `95` km/h (marked on the graph as a dotted magenta line). While this looks a bit like the graph of the logarithm function, it is quite different. This one starts at `(0, 0)`, does not pass through `(1, 0)` and does not increase without bound. We come across the same kind of graph again later, in the section on electronics in differential equations, Application: Series RL Circuit, where the current builds up in an inductor. 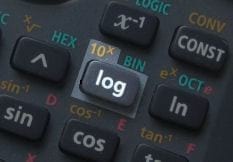 We do not have a `log_2 x` button on our calculators. The only way we can do this for now is to draw up a table of values and plot the points, or use a computer. Later we will see how to plot this using the change of base formula which we meet in 5. Logs to the Base e.
Unlike the graph in the previous example, this graph does not have a limiting value as x increases.